There I was, 12:26 a.m. on February 2nd, 2017, wide awake. I knew I had class at 8 a.m. and had to get up in six hours, but there I was, heartbroken. Pat McAfee, punter for the Indianapolis Colts, but more importantly a great humanitarian in the city of Indianapolis, retired at age 29. Yes, a punter retiring had me heartbroken. Pat McAfee came to Indianapolis in 2009 as a 7th-round draft pick out of West Virginia to be a punter. If you have watched his comedy special “Uncaged,” you know that he did not have previous punting experience before coming here. The day after he was drafted, Pat and his dad went to his high school to learn how to punt, and they were not going anywhere. Hearing where he was the day after the Colts had taken him with the 222nd pick, to being a pro bowl punter and potential Hall of Famer, shows the dedication that Pat had to be the best he could be, all for the shoe. In his 2nd year in the NFL, Pat was kicking off Super Bowl XLIV against the Saints where he stated multiple times he was about to “soil” himself. Then came the alleged canal incident in Broad Ripple that everyone knows about, and McAfee embraces. After that, he became a pro bowl punter, leading one of the NFL’s best special team units with hall of famer, Adam Vinatieri, and pro bowl long snapper, Matt Overton. 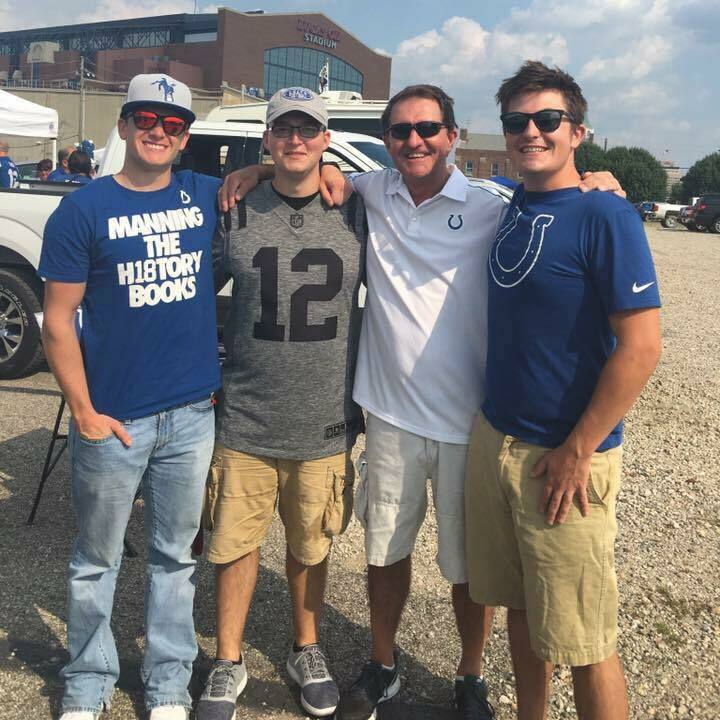 These three were referred to as the “4th Down Army,” and made shirts to give to fans at events, making them the league’s most well-known special teams unit. But to the city of Indianapolis, Pat McAfee was more than a punter, he was a humanitarian and ambassador for the city of Indianapolis. When McAfee came here in 2009, he was not just greeted by the city, he was greeted by the state with that world-famous Hoosier Hospitality. Pat McAfee loves Hoosier Hospitality. After the alleged canal incident, he cleaned up and started doing more in the community and made himself one of the sports world’s must-follows on Twitter. I’ll be honest, I was very hesitant on following a punter on Twitter because he was just a punter. But, after some convincing from my friend, Matt, I followed Pat and never looked back. My friends and me quickly became enamored with our favorite team’s punter and were determined to meet him and just have a conversation with him, we did. July 16th, 2013, we noticed Pat was at a county fair and recognized where we he was, he was at the county fair about 25 minutes away from my house. We were not going to let this opportunity pass. Lincoln and I called Nate and he got off work and we were off to the Jennings County Fair in Nate’s Sebring. We were giddy and ready to meet Pat McAfee. We did. Pat was nicer than we could have ever imagined. Couple weeks later, Pat noticed us at our county fair and approached us, “hey you guys know where I can get the best f***ing corndog of my life around here?” Dying laughing, we directed him to the Immanuel Church fair stand so he could get a corndog. Coolest guy ever. The comedy shows, the foundation, Pat McAfee himself- are not leaving Indianapolis. He made sure to make that point. He loves Indianapolis and Indianapolis loves him. He raises money for military families and veterans, he pays random people’s IPL bill (still waiting for the day mine is paid for), he does comedy shows to raise money for various causes, you name a cause and he is happy to help. Pat McAfee is not going anywhere. We cannot be mad at this decision. Would people like to retire at age 29 and live life comfortably? Yes, but there is only one Pat McAfee. Pat cited health reasons for this decision. Three knee surgeries in four years is a lot on a guy who swings his leg as viciously as he possibly can and come down on the other leg. Can we rule out the possibility of Pat coming back after a year or two of rest and getting his body right? No, but the only person who knows that is Pat himself and he does not even know the answer to that yet, only time will tell. Thank you, Pat McAfee, for everything. For making 4th downs fun, for making social media fun, for making the city of Indianapolis a better place, for telling people to love each other, and most of all- thank you, for being you. Enjoy those strawberry margaritas, my friend. Cheers.